It would be useful to have growth trend graphs for each of the analytics packages I track, but collecting such data is too time consuming since it must be re-collected every year (since search algorithms change). What I’ve done instead is collect data only for the past two complete years, 2013 and 2014. Figure 2e shows the percent change from 2013 to 2014, with the “hot” packages whose use is growing shown in red. Those whose use is declining or “cooling” are shown in blue. Since the number of articles tends to be in the thousands or tens of thousands, I have removed any software that had fewer than 100 articles in 2013. Going from one to five articles may represent 500% growth, but it’s not of much interest. Figure 2e. Change in the number of scholarly articles using each software in the most recent two complete years (2013 to 2014). Packages shown in red are “hot” and growing, while those shown in blue are “cooling down” or declining. The three fastest growing packages are all free and open source: Python, R and KNIME. All three saw more than 25% growth. Note that the Python figures are strictly for analytics use as defined here. At the other end of the scale are SPSS and SAS, both of which declined in use by around 25%. Recall that Fig. 2a shows that despite recent years of decline, SPSS is still extremely dominant for scholarly use. Three of the packages whose use is growing implement the powerful and easy-to-use workflow or flowchart user interface: KNIME, RapidMiner and SPSS Modeler. As useful as that approach is, it’s not sufficient for success as we see with SAS Enterprise Miner, whose use declined nearly 15%. It will be particularly interesting to see what the future holds for KNIME and RapidMiner. The companies were two of only four chosen by the Gartner Group as having both a complete vision of the future and the ability to execute that vision (Fig. 7a). Until recently, both were free and open source. RapidMiner then started charging for its current version, leaving its older version as the only free one. Recent offers to make it free for academic use don’t include use on projects with grant funding, so I expect KNIME’s higher rate of growth to remain faster than RapidMiner’s. 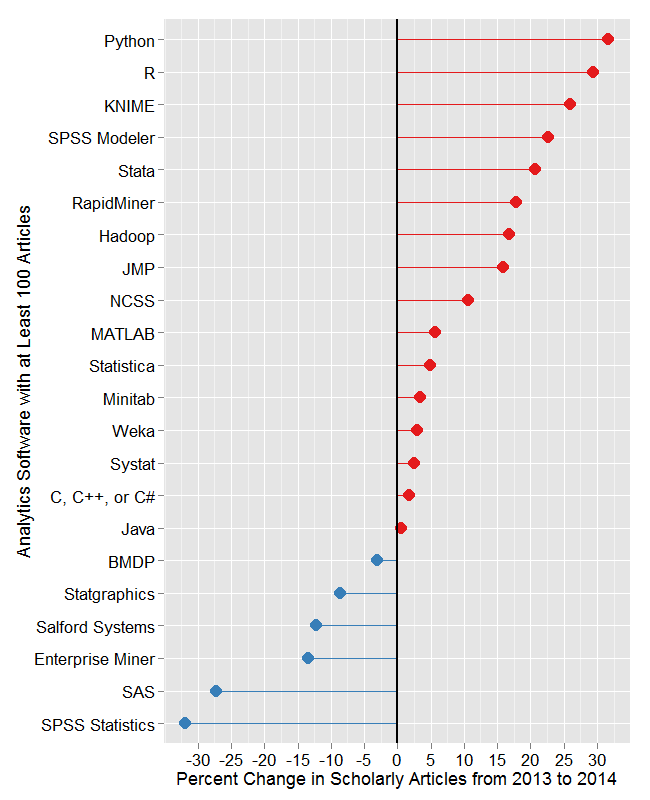 However, in absolute terms, scholarly use of RapidMiner is currently almost twice that of KNIME, as shown in Fig. 2b.